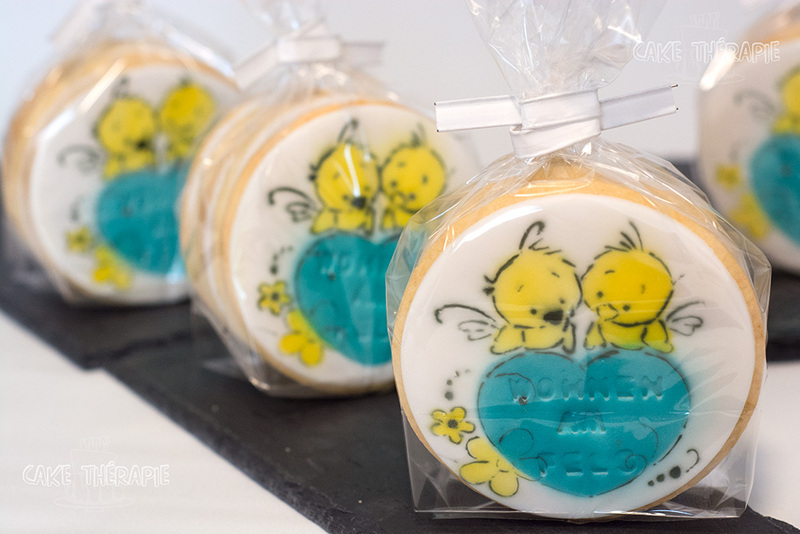 Tale Of A Sugar Cookie! A few minutes ago I was a pack of loose flour, sugar and butter and a quick blitz in the processor followed by a short but enjoyable knead, I turn into this one big delicious ball of dough. It was a whirlwind of activites which lasted less than 15 minutes! My good friend Mr. Leavening was left out, to help keep my shape and I am glad as I have been working on keeping the perfect shape possible. Life has been good so far. Good long 8 hours of rest in the chiller which I confess I was getting used to, when suddenly I get pulled out of my slumber only to be put through such torture and pain I could never imagine! First a couple of minutes under the big giant rolling pin where they rolled me flat, then a sharp cookie cutter. Ouch! That did hurt! Once I was cut into many tiny rounds, they put me back in the chiller again. A half an hour of pain relief that’s how I took it and I thought to myself, maybe finally the ordeal is over. The hottest 9 minutes of my life were yet to come. Gasping for air and screaming for good old life, I just wanted to come out of this fire ball they call the OVEN. I think I almost passed out when the cold touch of metal bought me back to my senses and oh cookie, that was such a respite from my exertions. A couple of minutes on the cooling rack I slowly transform from a soft pliable dough into a ‘chewy on the inside crunchy on the outside’ kinda cookie. Well this is my side of the story, lets hear from madame baker how she went about decorating me. I saw her clicking some progress pictures to share. This is me with the 'dare to bare' look! Wait until you see me all decorated! Hello readers! Hope you are still with me. That’s one brave cookie I must say. But all’s well that end’s well, isn’t it? Once after the cookies were cooled and stored properly, it was time for some cookie decorating fun. I cut out stencils from clear plastic folders since I had 50 of them to decorate and painting or piping them individually would have taken forever. 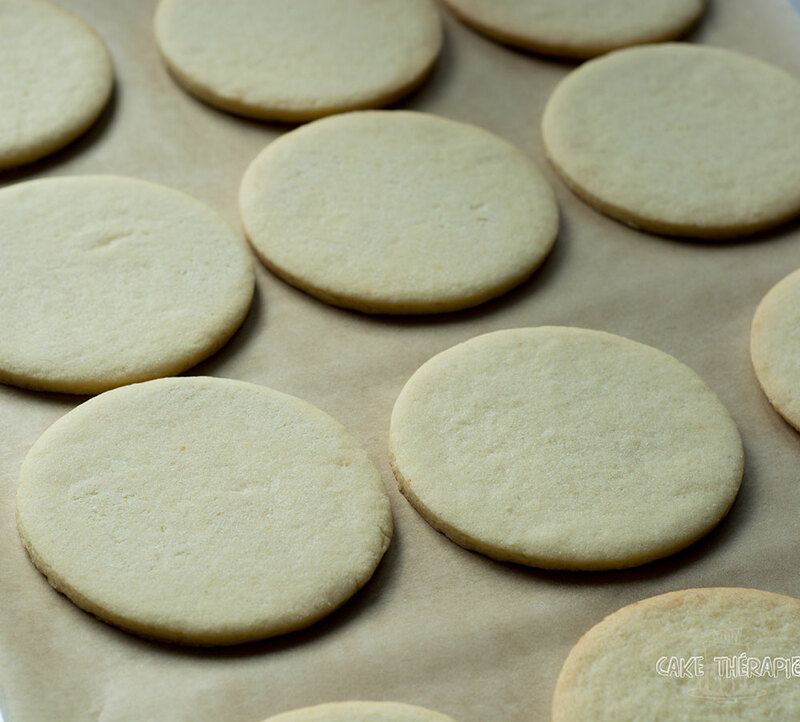 Next I cut out thin fondant circles the same size as the cookie and stuck it on to the cookie and waited for them to dry hard enough as to not leave any fingerprints or dents. I went about it like a production line. 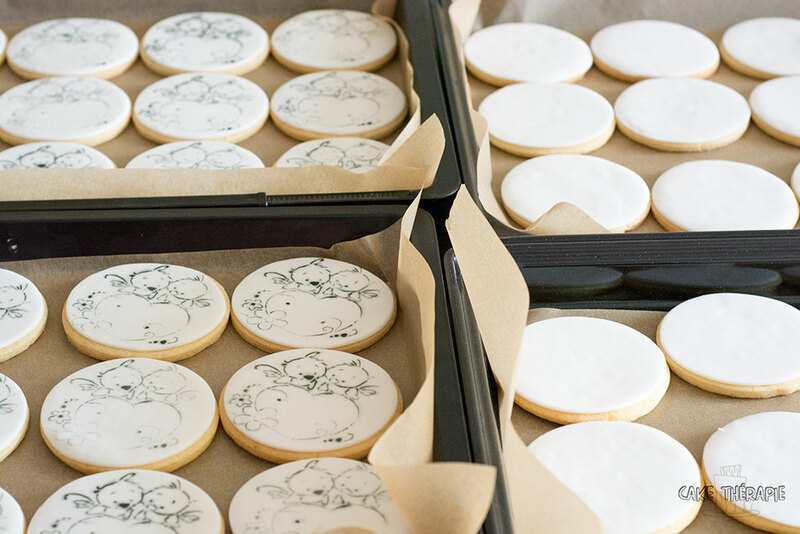 I placed 12 cookies on a tray and started stencilling the outline with an airbrush, one cookie at a time, making sure the other cookies didn’t get tinted with an over spray. 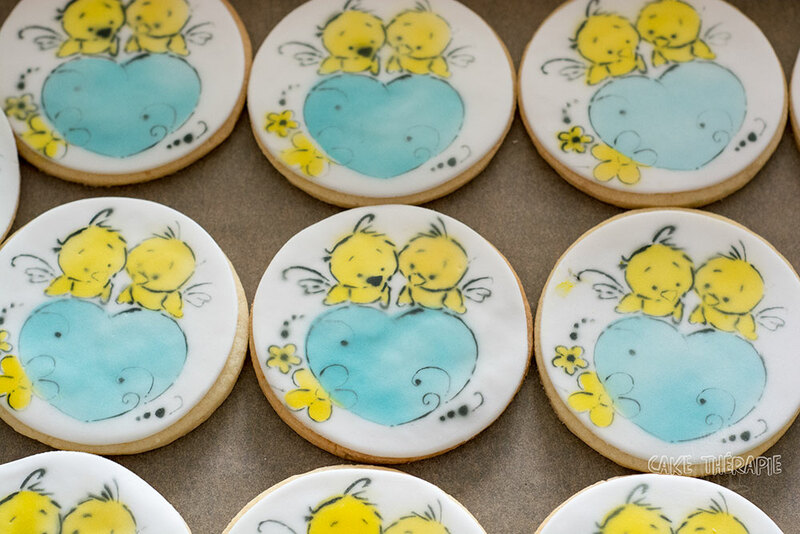 By the time I reached the last of the cookies in line, the first one’s had dried up enough to go on to the next process of colouring without smearing the outline. Next the hearts were coloured blue and when they had dried enough to touch, the birds were coloured yellow. Lastly the names of the family members and the message were embossed. 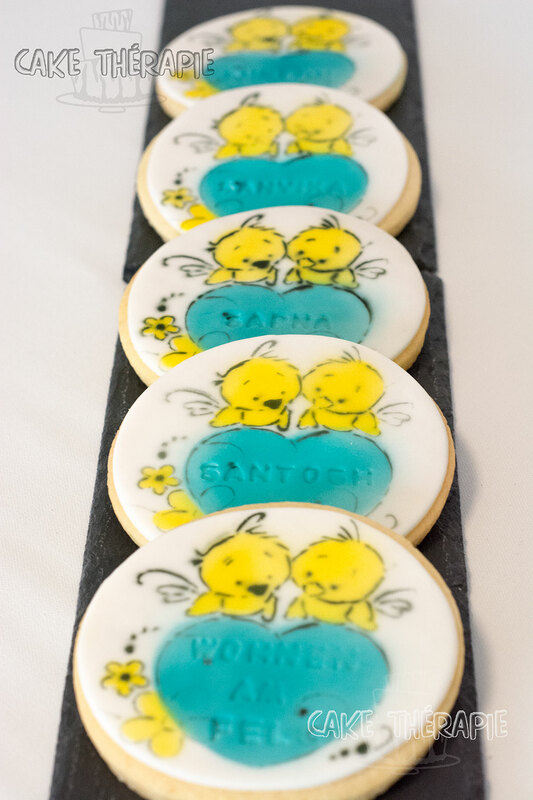 Concept to Completion and 20 hours later, these beautiful cookies were packed and ready to serve their purpose! 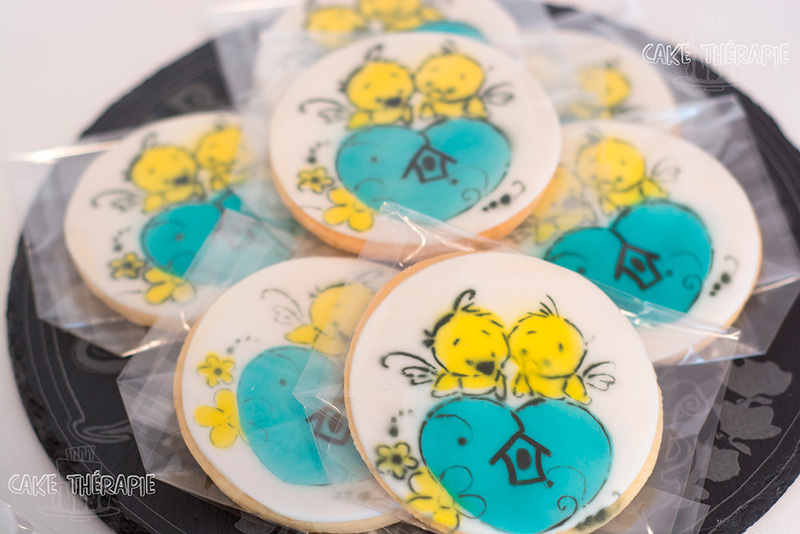 House warming party favours for the new neighbours and treat for work colleagues. Home cosy home, for both the owners and the cookies! As they say, 'Home is where the heart is'. Congratulations on your new HOME!